Reasonable Cause is based on all the facts and circumstances in each situation and allows the IRS to provide relief from a penalty that would otherwise be assessed.Each case is judged individually based on the facts and circumstances at hand. It is important that a thorough and factual reasonable cause explanation is prepared with your abatement request by experienced tax representation, such as Tax Samaritan, to increase your likelihood for a penalty abatement based on reasonable cause. Correction Of Service Error: As unbelievable as this may sound, the IRS can occasionally make an error in computing or assessing tax. When identified by the taxpayer or a tax professional, IRS errors can be abated. With assistance from experienced representation from Tax Samaritan, the IRS will consider proper and complete requests for penalty abatement (relief). 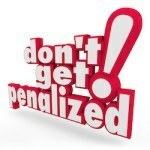 A simple penalty abatement request that is sent generally will not be sufficient. Most insufficient abatement requests are rejected. Nevertheless, it is always worthwhile to make a request – but the request must be well thought out.